We recently had a request to take a look at the Ceramic floor tiles installed at a fairly new office building in Lancaster. Well over 300 people work at the builder and they all come and go via the entrance hall where ceramic tiles have been installed which when wet were very slippery. To confirm this we conducted a pendulum test which is a specially designed piece of certified equipment that measures the surface co-efficient of friction which basically is a recognised measure of how much traction a surface has. The testing is very detailed and the output is an official report that can be used for insurance purposes; the report came back high risk which was expected so no surprise there, the next step was to see how this could be improved. As well as maintaining Tile and Stone Tile Doctor are also trained in the application of Anti-Slip treatments so we were asked to apply Anti-Slip to the 36m2 of Ceramic tiles in the entrance and rectify the problem. We do this by first getting the floor as clean as possible for which we use a dilution of Tile Doctor Pro-Clean worked into the floor with a rotary machine fitted with a scrubbing pad. The dirty cleaning solution is removed using a wet vacuum and the floor rinsed with clean water. The second step is to apply a Priming and Locking solution which is part of the treatment diluted one part solution to four parts water. This is then left to dry and once dry is followed by the application of the Anti-Slip treatment itself. The third step in the treatment is to re-apply the diluted Priming and Locking solution before the floor fully dries out and it’s this last step that activates the treatment and locks it in place. There’s no need to wait for the floor to dry at this point it can be used immediately after the last step has been applied. Once completed we conducted another Pendulum test so this could be compare to the original test to see if there had been any improvement. I’m glad to report the treatment worked as expected and the latest report came back as low risk. The customer keeps this to prove to any potential insurance claimant that steps had been taken to make the floor as safe as possible. You might notice that floor looks much better as well. I should mention that the work was carried out outside of working hours so no disruption was made to the normal operation of the building. We received a call to visit a house in Chorley where the grout in the kitchen tiles had gone black with the build-up of dirt and the owner was having trouble cleaning it. Porcelain and Ceramic tiles are a great choice for kitchens as they are very easy to clean however what most people don’t realise is that the top layer of grout is actually porous and can becomes stained with dirt. With the agreement of the home owner I did a test clean using a strong cleaning product called Tile Doctor Remove and Go leaving it to dwell on the tile and grout before scrubbing it in by hand and then washing off the soiled solution; you can see from the photograph below that the tile and grout cleaned up nicely so I was booked to do the job the following week. On my return I repeated the earlier process on the whole floor cleaning the grout with Remove and Go and working it in along the grout lines with a stiff grout brush making sure to thoroughly scrub every grout joint working in small sections at a time. Once I was happy with the grout in a section the floor would be rinsed off with clean water and a wet vacuum was used to remove the dirty water. I did this all over the floor until all the grout joints were clean retreating areas that needed extra attention. The next step was to give the ceramic tiles a good clean by applying a strong general Tile and Grout cleaning product called Tile Doctor Pro-Clean. The solution was scrubbed onto the floor and left to dwell for ten minutes scrubbed some more and then rinsed off. The floor was then washed down with clean water three times to make sure all the cleaning products had been removed and then dried with a wet vacuum. I then left the floor to completely dry for a couple of hours and came back later to check all the grout joints were clean and followed up with a bit of detail work on corners and edges rinsing the floor again when I had finished. I managed to complete the job in a day and with all the cleaning the tile and grout came up much lighter than before making it look like a new floor had been installed. The customer was really happy with the final result and left the following feedback on the Tile Doctor feedback system. Heidi cleaned a very dirty tiled floor back to its original state and it now looks superb. She was extremely professional and courteous but just as important she didn’t leave a mess like a lot of tradesmen do!!! I would have no hesitation in recommending Heidi to any of my friends to carry out similar work. A job well done!!! The remedy was to give the floor a good deep clean and then reseal so I got to work and applied a medium dilution of Tile Doctor Pro-Clean onto the floor leaving it to soak in for fifteen minutes before working it in with a black scrubbing pad fitted to a rotary buffing machine. This process soon had the dirt running out of the floor and the soiled solution was removed using a wet vacuum. The process was repeated for stubborn area and this time the grout was scrubbed by hand using a stiff brush and more Pro-Clean. Pro-Clean is a multi-purpose alkaline based cleaning product that’s safe to use on Tile, Stone and Grout and given there was hardly any sealer left it wasn’t necessary to use a stronger dilution. Once I was happy with the floor it was washed down with more water to remove any trace of cleaning products and then the water removed using the wet vacuum and then left to dry overnight. We have a number of sealing products suitable for Slate and Marble each one with a different effect but given then floor was predominately slate I decided opt for four coats of Tile Doctor Seal and Go which provides stain protection and leaves a nice low sheen finish. Before leaving I let them know about Tile Doctor Neutral Clean which is a cleaning product that has a near neutral PH and is specially designed for cleaning sealed floors. Southport is an interesting seaside town with many Victorian terraced properties so it came as no surprise when I was asked to maintain a Victorian Tiled hallway in the town. The floor was in good condition for its age and just in need of a clean and re-seal to keep it looking good, hallway area’s as you can imagine get more footfall than other parts of the house so are more likely to need a regular deep clean. To get the floor clean and remove any remaining sealer the floor was sprayed with Tile Doctor Remove and Go which was left to soak into the tile for five minutes before being scrubbed in using a rotary machine fitted with a black scrubbing pad. The next step was to wash off the residue with water which was then removed using a wet vacuum. Following this the tiles were given a rinse in Tile Doctor Grout Clean-up which is an acid based product that can remove grout smears and mineral deposits, it also improves the ability of the sealer to bond with the tile. Last step before sealing was to give the floor a thorough wash down with clean water, which is designed to remove any trace of cleaning products before sealing; the water was removed with the wet vacuum and then left to dry overnight. The next day I returned and checked the floor for dampness using a Damp Meter which indicated the floor was dry and ready for sealing. For Victorian Floor tiles I recommend several coats of Tile Doctor Seal and Go which provides a low sheen finish whilst offering great stain protection. These photographs are of a Stained Terrazzo Tiled floor from an old Fish and Chip shop in Wigan which had been closed for several months due to the owner being ill. The shop had then been sold and the new owners asked us to call in and re-furbish the tired and badly stained tiles rather than go to the expense of re-tiling or re-surfacing the Floor area, which would have cost a lot more than what we charged. Terrazzo is a composite tile made up of Marble and Limestone chippings, sometime Granite, all mixed into a clear cement resin and then made up into tiles of all sizes. We estimated these tiles we laid more than fifty years prior and were not looking their best after being stained with rust stains from heavy equipment, cooking oil and grease, ingrained dirt and grime. Although a tough job to tackle it didn’t put us off and as you will see we still managed to get them clean again. The method we used to restore the surface was to cut them back using a set of burnishing pads which take off a few millimetres off the tile surface and regrinds to make them look as good as new, this is something you can’t do with Vinyl Tiles or Ceramic and Porcelain. The pads are encrusted with diamonds and are used in conjunction with a little water; you start with a coarse pad and work through the set of pads which become finer in grade as you progress until your polishing the surface. Once this process is complete the floor was given a good wash down to remove any soil and allow us to spot any areas that needed further attention. When the Terrazzo tile was dry it was sealed sealing with two coats of Tile Doctor Colour Grow which is an impregnating matt sealer that brings out the colours in natural stone, the client had also specified they didn’t want a shiny finish as they had a concern about slippery surface that could lead to slips and falls. Once the sealer was dry it was buffed using a white buffing pad. The results are quite satisfying given the age of the floor and the stains we had to deal with not only that but the owner had engaged a number of other cleaning companies who had tried a test clean and he had even tried cleaning it himself but the results were poor. 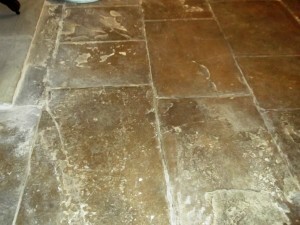 Details of an original Flagstone Floor cleaning job below from a Victorian House in the City of Lancaster, we often find flagstone floor tiles in kitchens and hallways and in this case they were in the hallway. You can see from the photographs below that the flagstone floor tiles were in a very bad state and it became clear that no amount of cleaning was really going to remove the decades of trapped dirt embedded in the pores of the Sandstone. To get over this problem it was necessary to remove the top surface of the flagstone using a milling pad together with a small amount of Tile Doctor Pro-Clean. The flagstones were then washed down with water which was then removed using a wet and dry vax machine. There was no damp proof course under the tiles so I left it to dry for a week before coming back to seal. The milling process had opened up the pores in the sandstone flagstone floor tile so to seal it I used 1 coat of Tile Doctor Colour Grow in order to bring out the colour in the stone and then topped this off wth a further 3 coats of Tile Doctor Seal and Go.